You all would agree with me that Olamide is one of the Most Successful Artistes out of Nigeria. No one thought Baddo would have gone this far but he was able to do it himself with the power of hard work and consistency. Nobody in the Industry can point at Olamide‘s glory (I mean, No one can come out to say he made Olamide and that was the reason he was so bold to blast Don Jazzy when the HipTV Headies Award mess happened between YBNL’s Lil Kesh and Mavin’s Reekado Banks some years ago). Well, if you are a hustler, here are some things you can learn from Olamide to make 2019 a great year for you. Olamide is not like most of the other popular artistes that I know, most are from a rich Background. 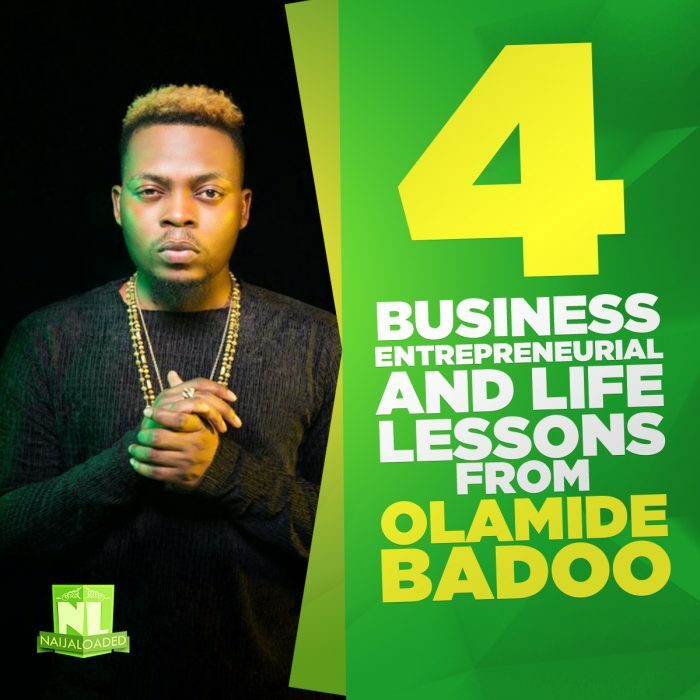 Others had a good opportunity from record labels, but Olamide Baddo has a different story, from street to hits. Once y0u try the process and you believe in your hustle, everything you pray for will happen overtime even bigger and better than you want them to be. Hardwork and Consistency is the Key if you wish to grow. Olamide was and is still loved because of the quality of his Yoruba rap lines. With the kind of song he makes, no one thought Olamide would attain such height with his kind of song? Olamide’s Yoruba rap is why I loved him back then, Eni duro to Young Erikina, and then other rap hits like Eeyan-Maywether and up till this moment. Looking at this, I have always told myself to stick to quality and uniqueness, I didn’t create a News Blog like my friends would do, I know Naijaloaded and lindaikeji are handling that very well already, and if I did compete with them I will need money, kudi. I decided to stick with a topic I have passion for, and that’s entrepreneurship, though I am not yet on top of the game like ‘Daddy Miliano‘, but I see a bright future. When olamide joined the fame league, he started partnering and helping people. I don’t know if Olamide partnered with Pheelz or signed him, the point his, he has one of the best producers one can think of In Nigeria. Olamide did not stop there; he has a very good communication skill and respects his colleagues in the industry. Olamide signed Lil Kesh, Adekunle Gold and others in a non-selfish deal.. That’s what I call Street love . “He (Olamide) was once a nobody, but now, he’s a somebody that’s ready to make a nobody into a somebody”. My part of the story is, when my fame finally comes, I won’t be selfish in anyway. Olamide is known to be a rapper, but while that is very true, he has one of the best chorus lines, look at Bobo And Melo Melo . He does different kind of music with his uniqueness. Versatility is also needed in business, as time changes, so do our strategies. I wish to meet Olamide in Person, his story is my story and to everybody hustling out there, don’t quit. You can’t win today’s battle with yesterday’s weapon – You must be stupidly creative if you really want to excel in anything you do. In case you want 2019 to me an amazing year for you, consider all the above listed lessons and put them into good use.